Under normal conditions, gold and silver pretty much march along to the same drummer. But I expect it will be different, as we move ahead into 2019. What will happen to the price of silver if Da Boyz are able to hold the price of gold down? I believe it won’t matter; silver will move up regardless as the stretched-out silver/gold ratio starts correcting and moving lower. Jim Sinclair refers to silver as “gold on steroids.” That is the case on the way lower and on the way higher. In today’s daily I will present two events that should allow silver to break free of the blatant manipulation that has kept its price way too low for way too long. Once silver breaks free from JPMorgan’s shorting positions on the Comex, and is able to trade freely , there is no telling how high the price will go and how fast it will happen. Even if the price of gold is contained, which is not exactly a given, there are still two reasons to be optimistic about silver next year, which will allow it to significantly outperform gold. The first is the DOJ is looking closely at JPMorgan’s manipulation of silver. I cannot over-estimate just how important this event is. The second is simply a supply/demand condition for 2019. The mined silver will not be sufficient to meet the demand. That is a condition that usually leads to higher prices. Buyers who want or need silver will pay whatever it takes to obtain it and the way the market balances supply and demand is by raising and lowering the price to attain a balance. Let’s start off with a very important and interesting article that should not be missed. I considered it must reading for anyone who owns silver, or is curious why it has performed so poorly for the last few years. It looks to be a game-changer. 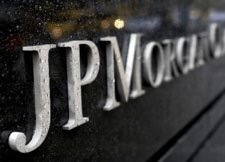 JPMorgan is being investigated for price fixing by the Department of Justice (DOJ). This is not the impotent CFTC; it’s the DOJ. They don’t simply levy fines and a slap on the wrist. They send people away. Is it any wonder that JPMorgan has now closed out it silver shorts on the Comex? Upper management over at JPMorgan has to be sweating bullets. People will go to jail. The DOJ is looking “up the management ladder.” The only thing holding down the price of silver (reflected by its near 86 to 1 silver/gold ratio) is JPMorgan’s manipulation and they have been put on notice by the DOJ. If they take their foot off the brake, silver is set to soar. It is hard to cheer for the Department of Justice these days, but federal prosecutions have begun to offer hope for precious metals investors hurt by rigged markets and crooked traders. The DOJ looks poised to do what regulators at the CFTC have not. They will use evidence of blatant cheating and fraud to hold a few bankers accountable. Last week, DOJ officials asked the judge in a civil suit against JPMorgan Chase to delay proceedings for 6 months to clear the patch for more prosecutions. Take a deep breath and let out a big “Hurrah”. JPMorgan is finally long gone from the silver market. They have covered their short position. The fact that JPMorgan is now back in a market neutral position is, as Ed Steer says,” wildly bullish”. A few follow up comments about the still rather remarkable announcement by the Department of Justice concerning the guilty plea by the former JPMorgan trader for spoofing in precious metals. Contained in the announcement was the statement that the guilty plea was accepted and sealed on Oct 9, nearly a month before it was unsealed on Nov 6. With a rather short sentencing date approaching on December 19, and the time it took to unseal the plea, it may be assumed that the trader has already fully cooperated in the hopes of reducing his jail time, said to approach 30 years with no cooperation. (Kitco News) – Next year will be a turnaround year for silver, with prices expected to rally to $17 per ounce by the end of 2019 on higher investor demand and an unexpected end to the U.S. monetary policy tightening, according to Capital Economics. 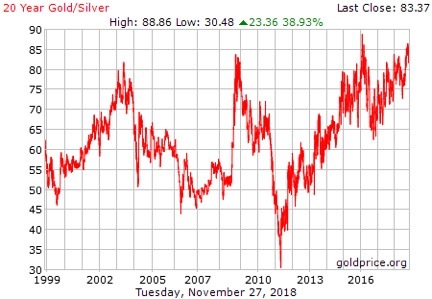 In case you don’t recall, the silver to gold ratio in the 2000s was often in the 40 to 1 or 50 to 1 range. There is a pattern on the following chart that is easy to see. After every sustained “rise” in the ratio, it is always followed by a “steep decline.” It would not be a stretch to expect the ratio to plunge back down to the low 50s or even the 40s. So what does that mean for the price of silver? Let’s say, for kicks, that gold moves up to $1,350. I think that’s very conservative, don’t you? At $1,350 with the silver to gold ratio at 50 to 1 the price of silver would be $27 per ounce. That’s almost twice as high as it is today (near $14). And if we set the price of gold at it’s most recent high of $1,900 should we not expect silver to at least reach it’s high at that time of $50? I think so, at a minimum. That would move the silver to gold ratio down to 38 to 1. $50 silver is not, in my estimation, a top. It is just a momentary stop along the way toward much higher prices. It’s human nature to chase a top. Greed sets in. You are witnessing it right now in the stock market. The “Normalcy Bias” sets in and people get used to rising prices and they begin to believe that this new trend will continue in motion. And it will, until it doesn’t. That, dear readers, is when you will be put to the test. “Is now the time to sell?” “Should I hold on longer for an even higher price?” Ah, I long for the good old days, but they will be back, and if the DOJ has anything to say about it, it will be sooner rather than later. Yes, 2019 should be one Hell of a year for Gold’s little sister.